spillyjane knits: Ribbon Mittens are out! As hinted at in yeserday's post, the Ribbon mitten pattern is now available! 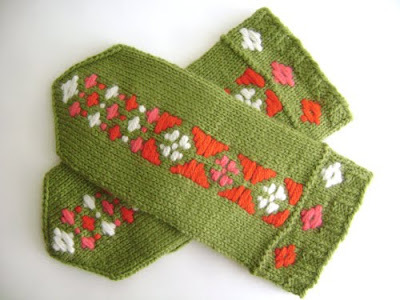 Simple mittens made very fancy by using the Estonian Roositud inlay technique -– a quick method that is the simplest colourwork technique that you’ll ever learn. 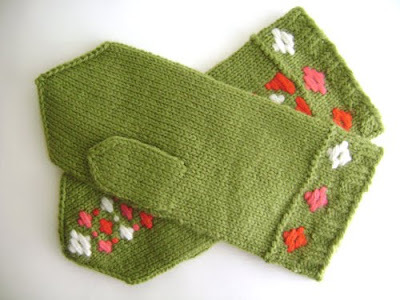 If you can knit Stockinette in the round and wrap stitches, you can make these mittens! Gauge: 6 stitches/8 rows = 1 inch (2.5 cm) in Stockinette st.
Notions: A 10” length of yarn in a comparable weight (but contrasting colour) to hold thumb stitches, a stitch marker to mark beginning of round (optional) and a sewing needle to weave in ends. Skills Needed: Knitting in the round, decreasing, Roositud inlay, twisted stitches, and chart reading. I should also mention that these mittens work up fairly quickly, too. They might be the solution to your holiday knitting problems! Gorgeous!! Stop tempting me with your lovely patterns!!! September 8, 2009 at 8:48 a.m.
beautiful mittens! i love the colors you chose. September 8, 2009 at 9:15 a.m. So cute! Trying to finish Camilla mittens before the deadline...but how to choose which pattern...? February 2, 2011 at 2:24 p.m.